I am fortunate to be surrounded by folks who are bursting with imagination, the kindred spirits that Anne of Green Gables was always keeping an eye out for. There are 2 such friends with whom I am having a most excellent, ongoing “practical-make-believe” adventure — Christa Couture and Lindsay Zier-Vogel, wonderful women and artists in their own rights, musician/designer and writer/book-maker respectively ( check them out, they are extraordinary). And what is our awesome practical-make-believe game? We have a “company” called Veggie Vag. It sounds just rude enough that it makes us giggle, hard. Veggie Vag started about a year ago. You might ask, is it about vegetables? Or, is it about vaginas? Both would be fair questions. Veggie Vag is not really about either, other than the fact that we’re all ladies. And we do like veggies. It’s really mostly about editing. And being friends across miles of space and life. And being hilarious to ourselves. We were all busy with applications, building websites and so on (the usual) around this time last year and were often editing for each other, enjoying getting the value of 2 perspectives on our work. We started to joke that we were like a collective. Then we decided we were a collective, which meant we needed a wicked acronym. Christa came up with both, she’s the most clever of us, hands down. VEG was first, it stands for “Virtual Editors Group,” which was funny and accurate. But then she said wouldn’t it be more awesome if we were authors — well, Lindsay actually is an author — then we’d be the “Virtual Authors Group,” ahem, VAG, which was infinitely more funny than veg. Put them together and we are really, virtually (as it were) the unstoppable Veggie Vag! The cool thing is that between the 3 of us we’ve edited grants and “About” pages and difficult emails and cover letters. I got an amazing logo by being a member (thanks Christa!) and we’ve all had a lot of success with the things we’ve edited for each other. Not only do we have this ah-mazing faux company together, we are quite useful to each other. Keeps us in regular contact too, which is brilliant! Christa Couture: What started as occasionally asking friends for editorial advice grew into a collective, not quite formal, but steadfast and dedicated, of three women supporting each other’s work. My own work is better for the input of the Veggie Vag, and I love being up to date with, if not also being helpful to, the work of my co-Vag-ers. The Veggie Vag is friendship and artistry combined — a team of writers, thinkers, brainstormers, schemers, planners and best of all cheerleaders … cheerleaders in yellow pant suits and berets. Or spandex. Depending. Veggie Vag even has an assistant! His name is Dane. Dane Joseph McKellen. He’s fabulous. He’s shower fresh even at 4pm. He anticipates our needs. Dane shows up with a latte just before you realize you need one. Dane reminds you of impending deadlines and copies all the grants. Dane keeps extra mascara and tampons in his desk drawer. Dane orders Thai when you’re working late. Dane put fresh flowers on your desk and clears the boardroom air with aromatherapy. I could go on and on about Dane, he’s a gem. 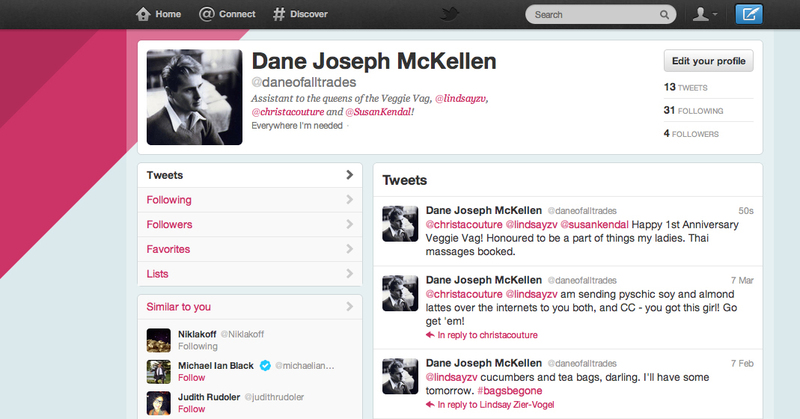 Dane even has a twitter page, of course, @daneofalltrades. If you’d like to check him out, drop him a line to tell him he’s doing great or ask for some wardrobe advice, do it! But don’t try and lure him to your company, he’s ours and is as loyal as the day is long. I got mugs made for our 1st anniversary this month. Dane reminded me that it had been a year since we named ourselves and signed the lease on our excellent, 2,800 square foot downtown Toronto loft offices. He suggested that mugs would be particularly classy. I agreed. 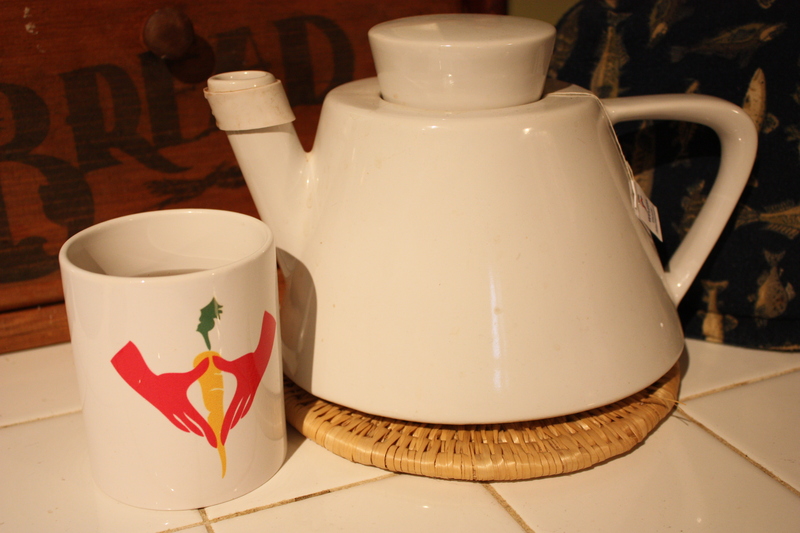 And every morning I drink tea and think of my Veggie Vag ladies, standing by should I need some extra eyes and perspectives. Or a laugh. Or commiseration. I am a dreamer. I love imagining and make-believing and creating — so much so that artist and creator became my profession, it seemed inevitable and obvious to me from a young age. I choreograph and dance, I make and inhabit worlds and ideas of my choosing and construction. I sew and craft, imagining and creating what I hope or suspect might work in fabric or paper. I also spend a few hours teaching creative dance to wee kids each week, which allows me to gallop as a horse, swirl as a wind storm, dart as a fish. It’s a space to remember the fantastic, immense imaginations we are born with. That we have the capacity to believe the impossible into all-sorts-of-possible at our start, but often squelch or embarrass or forget that faith right out of ourselves. 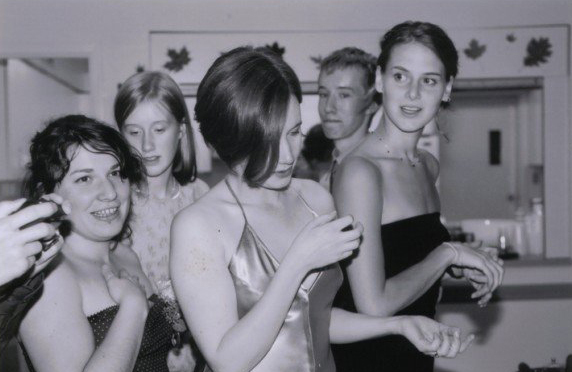 Cheers to make-believing, even, or perhaps especially when you’re an adult. That’s it for this Veggie-Vagger, over and out. This was so great to read….keep dreaming and keep the Veggie Vag alive! I love it all! for sopmething unique. P.S Apologies for getting off-topic but I had to ask!